Mmmmmm.... fresh baked bread. My weakness is sweet dough. 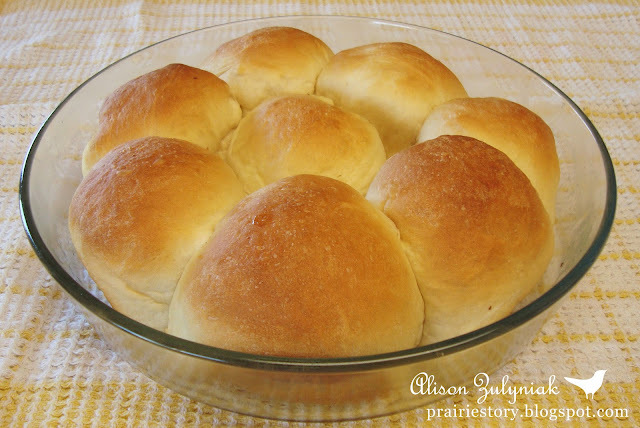 I use it to make Dinner Rolls, Sticky Buns, Herbed Bread, Hot Cross Buns and Perishke (meat filled buns). I actually use my bread maker to make the dough which follows a 20 minute knead, 1 hour rest cycle. I then turn it out, make it into whatever I'm baking, let it rest again for 10 minutes, then bake. If you don't already have a sweet dough recipe in your repertoire, I highly recommend it! I'm sure you can modify to mix in Kitchen Aid or by hand if you ensure you use luke warm milk, room temperature egg, and even warm flour. - Knead 20 minutes, rest 1 hour. - Place in greased baking dish and brush with melted margarine. - Let stand 10 minutes. - Bake @ 350° for 20-25 minutes. yummy! these look great!! I will be trying them soon! wish I still had my breadmaker. Mine started scraping the inside silver paint of the loaf pan into the dough! I always meant to email the company and never got around to it. Those look so good! What a perfection addition to a meal! I LOOOOVE homemade rolls!! I have never in my life made them myself but your recipe looks so easy. Thanks!! The dinner rolls looks lovely and perfectly baked! It would be perfect with homemade butter! These are just lovely! I can only imagine how good your house smelled when making these. They puffed up so nicely. Found your blog through links! Love your blog! If you ever need new recipes or want to be featured..than please come become a follower to see daily updates and email us if you would like us to feature you!!! These rolls look great! I love homemade bread, but I definitely don't make it often enough. they look yummy! hmmm... would love to make this, grabbing your recipe! here's my food trip friday entry. Just by looking at it, one could say it is perfect! My Food Trip Friday post is up HERE. I love breads and rolls made with sweet dough. Yours look so good! I don't know why, but I rarely make rolls, sweet or otherwise, here. I should. I love the smell and taste. Yours look fantastic, as usual. Maybe I'll give it a go tonight for dinner. Ok, I made these today and I must say...they were awesome. I am so out of practice with making homemade bread that I am not sure that I kneaded them enough. I used a dough hook on my mixer. It didn't matter. My husband was pumped and it was such a treat. Now I have to blog about it...and I will give you a shout out. I just love rolls. These look really good! Thanks for linking up for Friday Favorites! yummy, yummy, yummy, yummy, yummy!!!!!! !